For the first letter of our second run-through of the alphabet we teamed up with Random Recipes, hosted by Dom at Belleau Kitchen, and asked you to choose a recipe book at random, turn to the A section in the index and make anything in that section. It meant of course that we only had one entry per person – often I make two or three things for Alphabakes every month – so I had thought that it might be a shorter roundup than usual, but we’ve actually had loads of you taking part! The letter we chose this month was A and I kicked things off with thesemini amaretto cheesecakes from Marian Keyes’ Saved by Cake; the base is particularly divine! Jane at Onions and Paper was brave – not only did she choose a recipe book at random but she also used a random number generator to decide which recipe she was making! The result was Aga Khan’s lamb from Allegra McEvedy's "Big Table Busy Kitchen" which looks delicious. This entry comes from Janet at the Taste Space from a book called the Blender Girl; it’s a rice pudding spiced with chai-infused flavours and sweetened with apple, dried currants and maple syrup. It looks a lot nicer than the rice pudding I remember eating as a child! 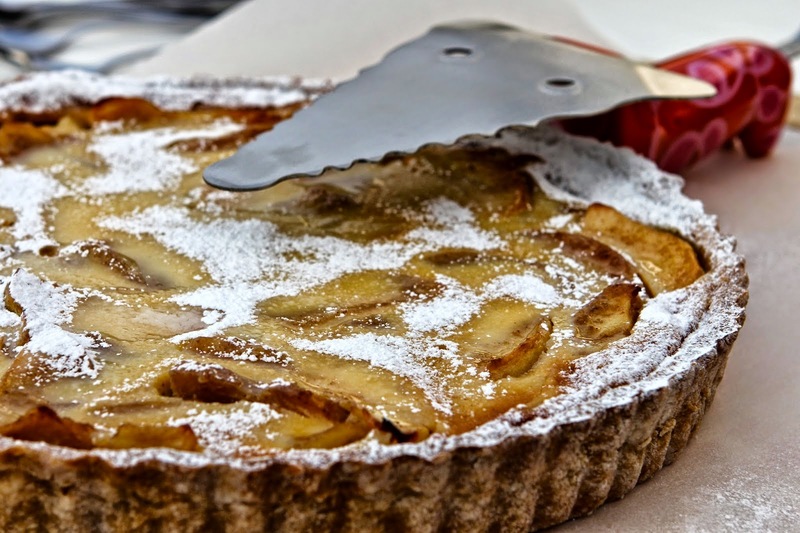 Apple was also the ingredient chosen by Jean at Baking in Franglais; she made plum and apple dappy from a book called Cooking with Apples and Pears. 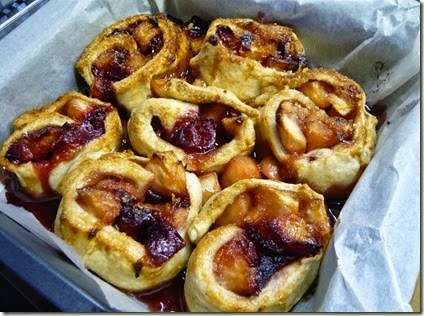 She says a dappy is like a pastry roly-poly; I haven’t come across it before but it does look very good! 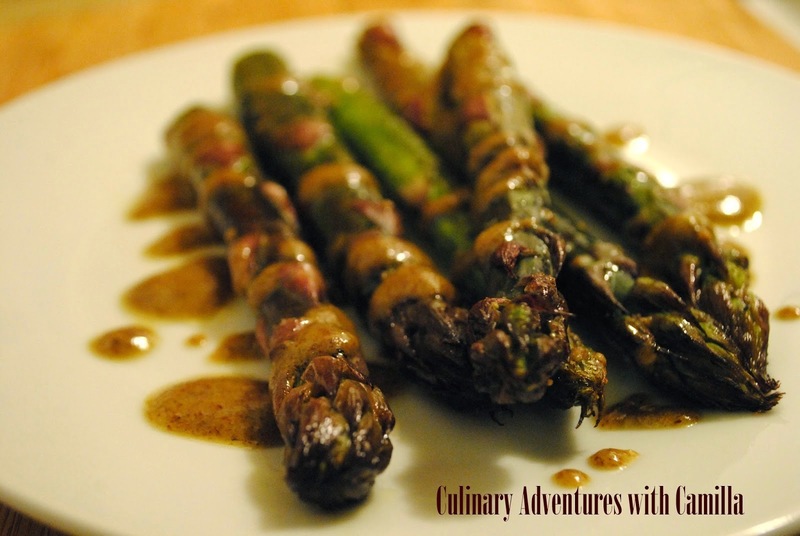 Camilla from Culinary Adventures with Camilla chose a book called the Artful Vegan and a very fine-sounding recipe: roasted asparagus with vanilla-lavender aioli. There are quite a lot of ingredients in the aioli but it all goes into the same blender, which is the kind of recipe I like! 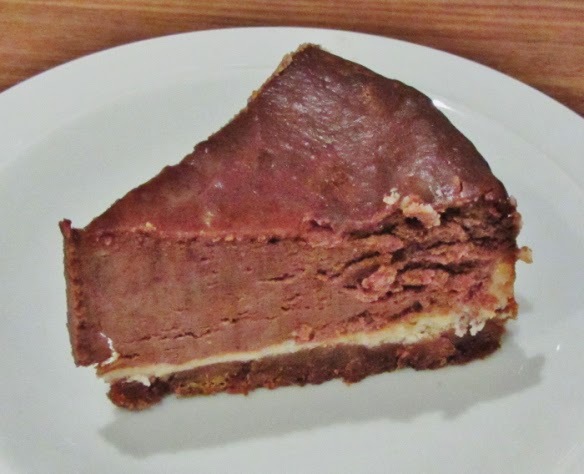 Here’s a very rich and decadent bake – Mary Berry’s American Style chocolate cheesecake, made by Corina at Searching for Spice. She says it turned out exceptionally well, but she did make a few tweaks to the recipe, which came from Mary Berry’s Baking Bible. Another American recipe, this time from the Silver Spoon cookbook. 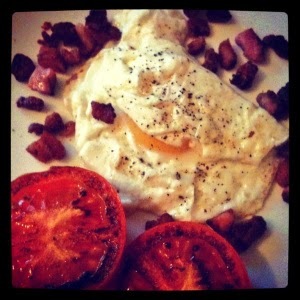 Nikki at Yummy Mummy Cooks the Books made these American Style Eggs, which are essentially just fried egg and pancetta and grilled tomato. But as Nikki says, sometimes the simplest things are the best! Another appearance from Mary Berry’s Baking Bible, which I imagine must be on a lot of bookshelves. My mum made this almond and chocolate chip cake, using a silicon flower-shaped bundt mould which I gave her for mother’s day. 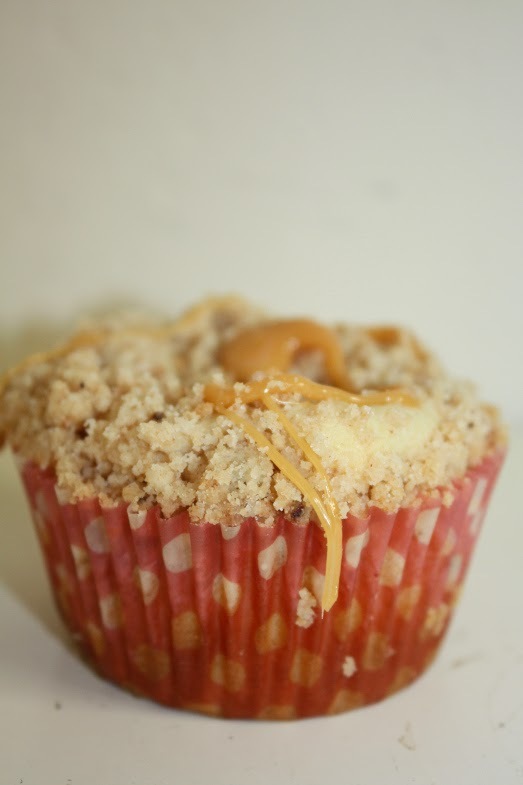 These caramel apple cupcakes from Elizabeth at the LawStudents Cookbook sound delicious. The addition of sour cream and almond extract sounds particularly good and the texture is almost like a muffin but it tastes sweeter. Choclette from Chocolate Log Blog almost ran out of time to bake her entry this month but I’m glad she did. She made a rhubarb and almond cream pie, swapping rhubarb for the plums in the original recipe and added white chocolate. It may not be that close to the original recipe but it looks like it turned out really well. 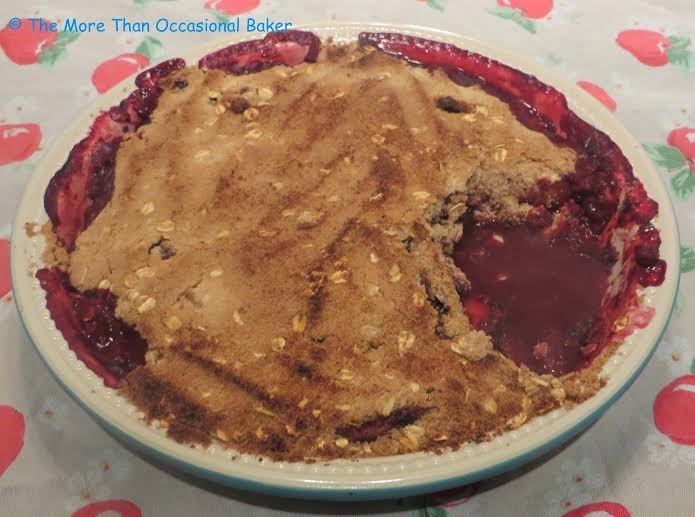 My Alphabakes co-host Ros, at The More Than OccasionalBaker, was very brave and chose both the book and the recipe at random, and came out with this apple and blackberry crumble. The blackberries she used came from a colleague’s garden and she added extra cinnamon to the crumble. The first book that Chris at Cooking Around the World chose at random didn’t have any A recipes at all! So he rolled the dice again and came up with this avocado salad with egg and salmon. He said it was so easy, it took longer to choose the recipe than it did to make! 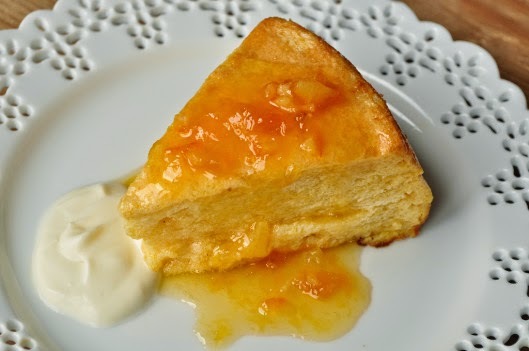 Alexandra, the Lass in the Apron, sent in this lovely and light apricot soufflé cake. It’s served with an apricot sauce and has a hint of Grand Marnier which sounds delicious. 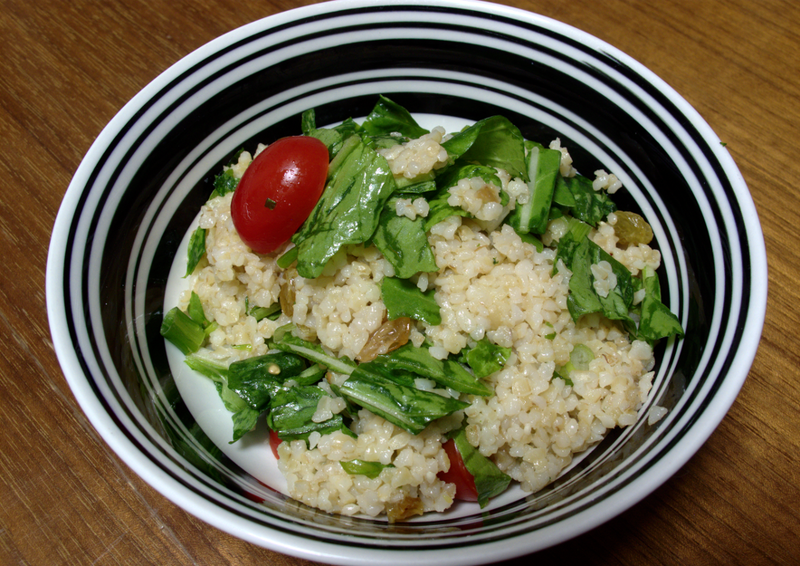 This month’s challenge introduced Amanda at Dancing Veggies to a new ingredient: bulgur wheat. The A in this case is arugula, which we know in the UK as rocket, and it went into this tabbouleh. Amanda says she didn’t spot that the recipe called for 2 hours of soaking but it looks like it turned out well anyway! Cheryl at Madhouse Family Reviews enlisted the help of her children to make this Granny’s apple shortcake from her brand new Ella’s Kitchen cookery book and it looks like they had a lot of fun! 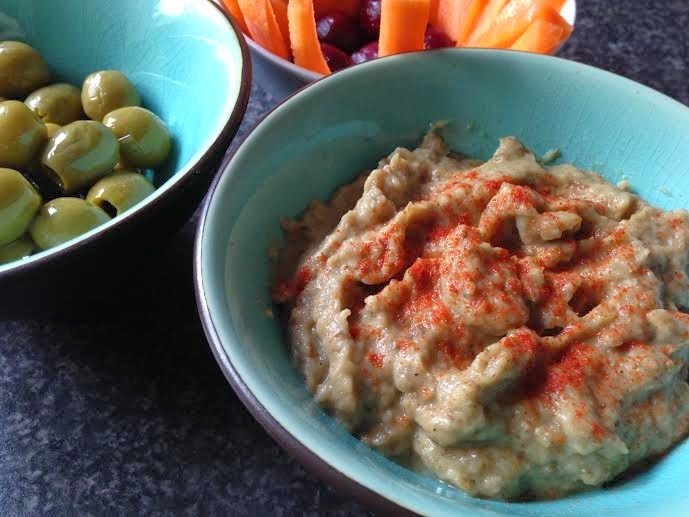 Aubergines take centre stage in this baba ganoush from Anne’sKitchen. She says the resulting garlic breath is worth it! Craig at the Usual Saucepans used avocado in this avocado and bacon salad – it must be healthy as it’s a salad. Right? 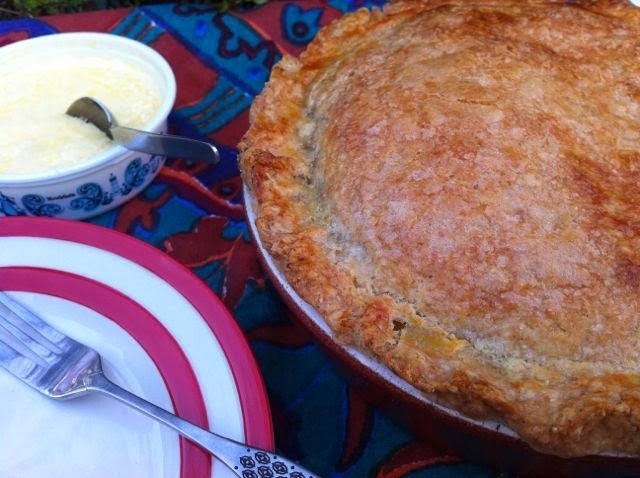 Kate, aka the Gluten Free Chemist, treated us to this Alsace Apple Pie. It looks beautiful - crisp cinnamony pastry, tart toffee-coated apples and creamy vanillary custard, and of course it’s gluten free. Atul Kochhar’s Aloo Dum is the entry from Jill of Lapin d’Or and More – a dish more simply known as potato curry. 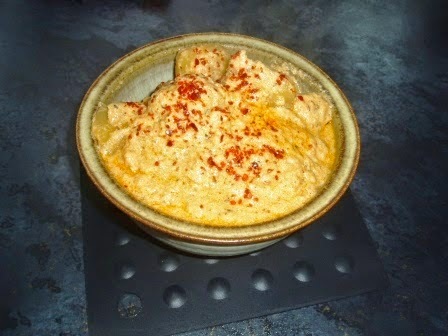 It’s good as either a snack or part of a main course and is bursting with spices. Another appearance for arugula, also known as rocket, in this arugula and walnut pesto from Fiona at Sweet Thing You Make My Heart Sing. 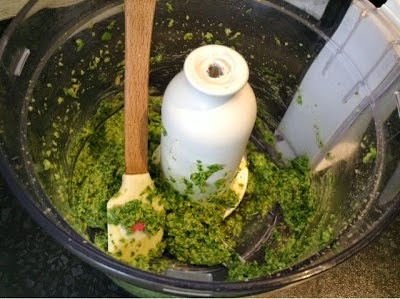 Rather than a book, it was from a recipe folder with cuttings Fiona had collected and this was the only one beginning with A – I’m glad as I do love pesto. Hosting the challenge jointly obviously didn’t quite work as I popped over to Dom’s roundup at Belleau Kitchen – he beat me to it by a couple of days – and found a few entries I hadn’t been sent. Including Dom’s own, in fact!
. Alison from Dragons and Fairydust sent in Ana’s Cheese Empanadas, created by the cleaner at the Leon restaurant chain who is called Ana. 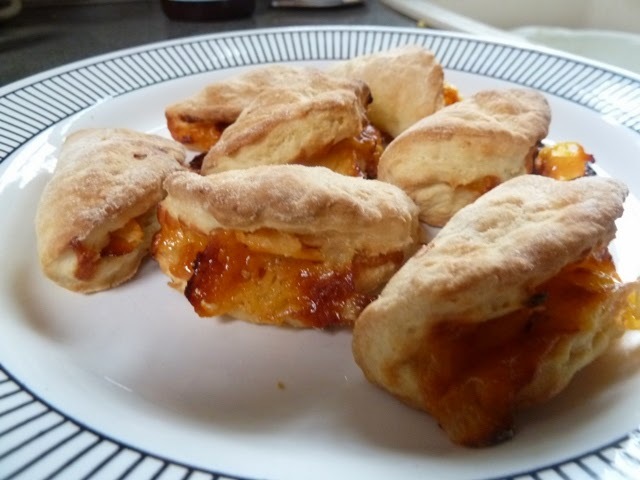 These are small cheese-filled pastries which look very more-ish. 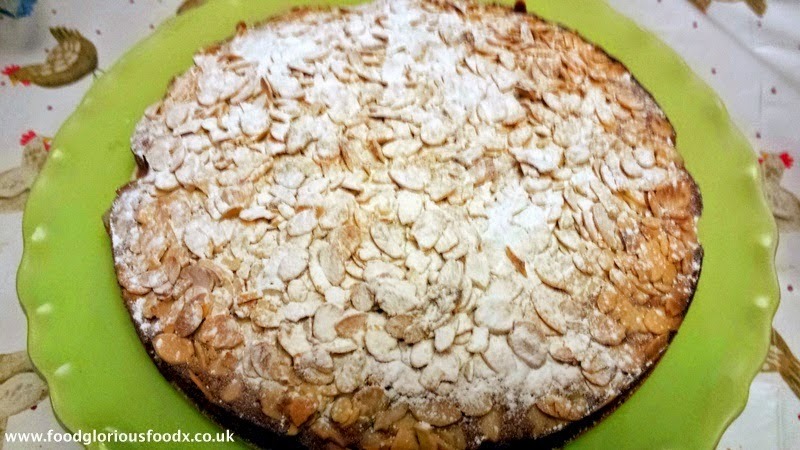 This cinnamon and almond cake comes from Charlene at Food Glorious Food and looks very tasty. 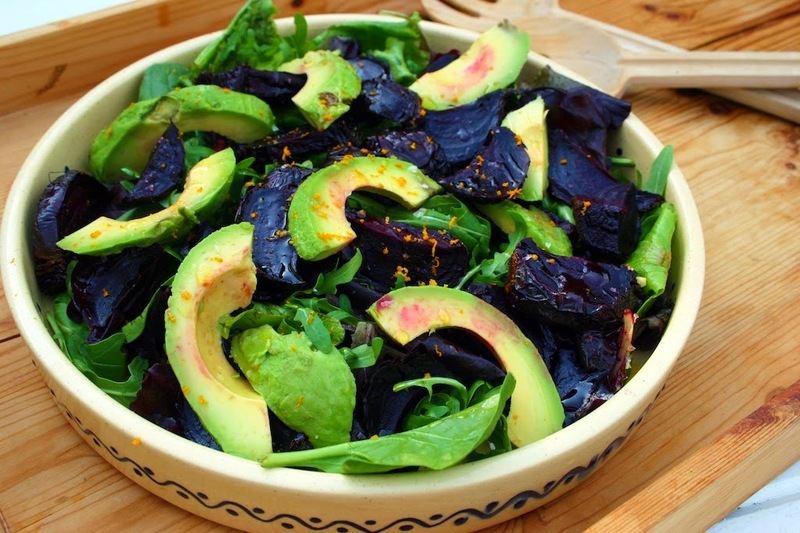 Dom’sown entry is an avocado and roasted beetroot salad which has allowed him to rediscover his liking for beetroot. Ruth from Makey Cakey sent in these apple custard muffins; again the first cookery book she selected had no A recipes, which I didn’t think would be possible but it’s happened to two peoplethis month! These, from Ruth’s second selection, look great. 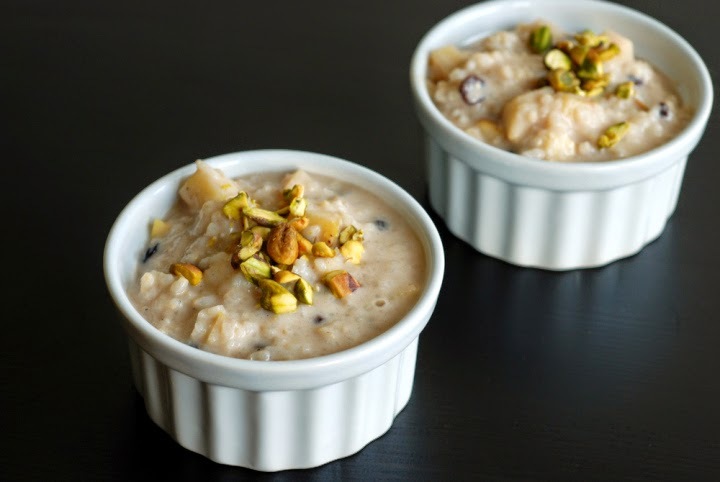 These unusual chai spiced rice puddings come from Janet at the Taste Space; the A ingredient is dried apple. 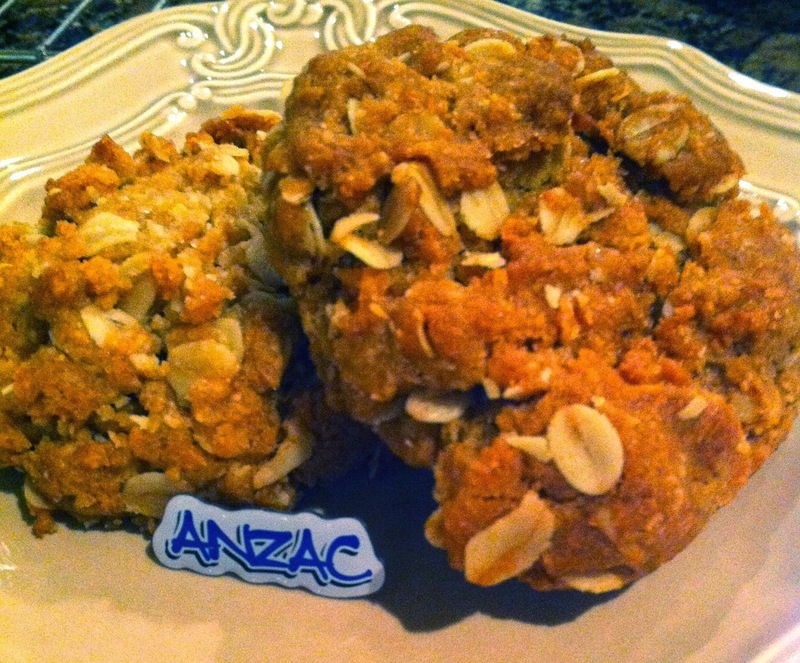 Anzac biscuits received their name during the First World War when they were made for Australian and New Zealand soldiers. Denise at Magnolia Verandah made them for Anzac Day when the soldiers’ contribution to the war effort is remembered. I think that is all the entries, please let me know if I have missed any! As I am a bit behind with publishing the roundup this month – it was my 35th birthday and I was away cooking with the Fabulous Baker Brothers then celebrating my birthday at the Wolseley with Samuel L Jackson (not literally – he was at another table). Ros at The More ThanOccasional Baker has already told us what letter we are baking with this month so if you missed the announcement, hop on over there and find out! 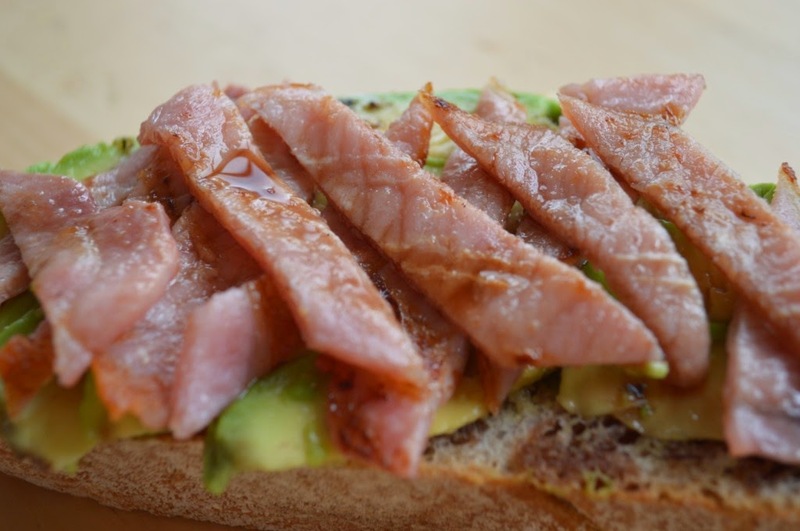 Awesome round up - a great start to round 2 of AlphaBakes.